At Kitesurf Mexico, you will find experienced and knowledgable people dedicated to teach and implement teaching and training strategies in kiteboarding. Everything we teach are strategies or tactics we have used successfully in our years of experience with students from all ages and from all over the world. At our school, specialized in kiteboarding, you will learn everything it takes to become independent in the practice of this sport. We offer a wide range of kiteboarding courses specially designed to meet the different levels of our clients, from beginners to advanced. 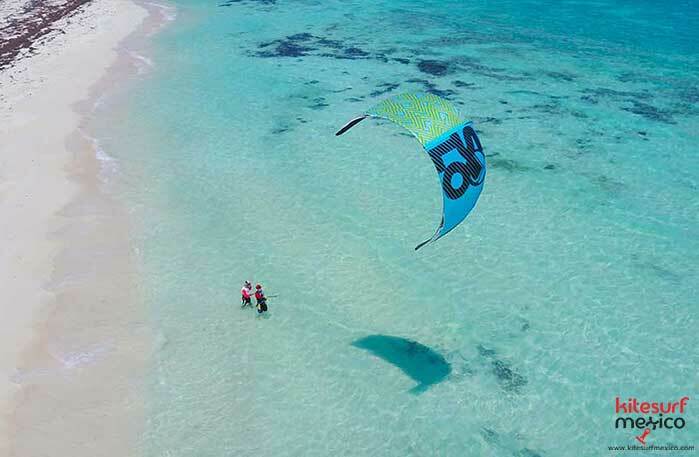 The full course is the best way to start kiteboarding, a fascinating sport. For this course, three days of your time are enough. By the end of the course, you will have learned everything you need to ride your kite on both land and water, thus achieving a certified independent kiteboarder level. We use Liquid Force kiteboarding gear at our school, for our courses and for rental. Our classes are completely private or for groups of people traveling together, such as families and friends, so we have limited spots. You can book classes with 100USD and pay the rest upon arrival. If the class is cancelled due to weather and wind conditions, we make a full refund of your deposit. We would like to thank our customers, whom over our many years of teaching kiteboarding to people from all over the world, have left excellent comments on TripAdvisor, helping us improve our service and growing our company.